This summer I received a postcard from a friend in Italy portraying the Madonna in the Basilica of Santa Maria Maggiore, the major church in Rome dedicated to the Virgin Mary. Far more than a just a beautiful image, this Black Madonna has been attributed with miraculous and awesome power. Her titles “Our Lady of the Snows” and “Salvation of the Roman People” offer clues of her power over the weather and her ability to protect a whole community. According to the legendary fourth century origins of the church, still celebrated today, the Virgin Mary caused snow to fall in August in Rome (a highly unlikely weather phenomenon) so that she could designate where she wanted her church to be built. She appeared to a couple and to the pope in a dream telling of the snowfall. She came to be known as Santa Maria della Neve, Our Lady of the Snows. On August 5, white flower petals are released from the church to celebrate the event and to simulate the miraculous snowfall. In the basilica, her image is framed with precious jewels, encircled with gold, and displayed against a deep blue marble background with a golden star above. Marble columns flank either side. The scene of the miracle of the snow is depicted in gold in the arch above her painting. One of the powers sometimes attributed to Black Madonnas is control over the weather. 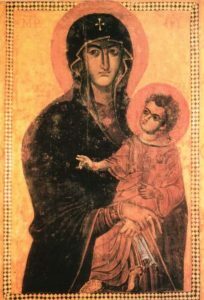 Like other Black Madonnas throughout Italy and the rest of Europe, the Black Madonna at Santa Maria Maggiore is considered to have protective powers, particularly against the plague. Pope Gregory the Great carried her image through the streets of Rome in the year 594 to pray for deliverance from a terrible pestilence. The dark icon became known as Salus Populi Romani, Salvation of the Roman People, and in 1837, Pope Gregory XVI again carried it through Rome during a cholera epidemic. It was thinking about this very miracle story while I was researching the Black Madonnas that made me realize that the church clearly considered (and still considers) Black Madonnas as powerful. The pope chose this image to protect the city from the most powerful disease. Over the centuries, scenes like this took place throughout Italy with other Black Madonnas to protect against widespread disease and natural disasters. I, too, have had dreams of the Black Madonna. While she hasn’t asked me to build a church or carry her image in procession, she has provided a comforting presence and guidance. In one dream with her appearance, there were a circle of women dancing, hands joined, completely elevated and horizontal to the ground. Their dancing had the power to affect what happened to the world around them. The Black Madonna also came to me after my mother died, and I was sleeping in her home. In my dream, the Black Madonna was alongside the road in the form of an immense dark tree – not unlike a wild olive tree I had seen in Sardegna on a study tour with Lucia Chiavola Birnbaum. I awoke with a tingling exhilaration as if I were between worlds. The Black Madonna’s presence gives comfort, guidance and more in my waking life as well. It is worth paying attention when the she shows up. This entry was posted in Black Madonna, Dreaming, Italy, Miracles by Mary Beth Moser. Bookmark the permalink. beautifully written account of a timeless encounter with our lady of peace and healing. I always love it when you are teaching and reflecting. YOUR voice is reassuring. It’s always interesting reading of your research plus personal experience. A lot to learn and to relfect upon! Thank you for sending the postcard to me, dear friend!